Macalester’s John B. Davis Lecture Hall (JBD) played host to the Democratic-Farmer-Labor (DFL) party on Tuesday night, as voters gathered here and across the state to pass resolutions, volunteer as delegates and participate in straw polls for governor at precinct caucuses. With incumbent DFL Gov. Mark Dayton not seeking a third term, the preference vote in the open governor’s race was a chief focus. Along those lines, it was a good night for Rep. Tim Walz. The southern Minnesota congressman underlined his status as the favorite in the DFL race with a commanding statewide victory – winning 31 percent of votes cast to State Auditor Rebecca Otto’s 20 percent. 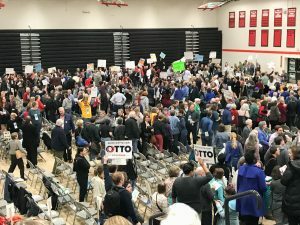 However, at the Macalester precinct, Ward 3 District 7, the tables were turned: Otto received 14 votes from the 52 caucus attendees, state Rep. Erin Murphy finished second with 10 votes and Walz and former St. Paul mayor Chris Coleman tied for third with 7 votes each. State Reps. Tina Liebling and Paul Thissen received minimal support, while a handful of voters remained uncommitted or did not fill out a preference ballot. Thissen dropped out of the race on Wednesday. The precinct caucus in JBD was chaired by Marco Hernandez ’19, while two other Macalester students – Jane Roarty ’20 and Karinna Gerhardt ’20 – were elected as associate chairs. Hannah Hill ’20 arrived too late to participate in the straw poll, but came away with a particularly positive impression of one candidate. Walz might be a pragmatic choice. The first congressional district was a Republican stronghold for nearly two decades before he was elected in 2006. It favored Donald Trump by 15 points in 2016 while re-electing Walz by less than one. In Congress, the former geography teacher and high school football coach was known as a moderate: a staunch defender of LGBTQ+ and women’s rights who also had an “A” rating from the NRA and voted in 2015 for the American SAFE Act – a proposal that would have effectively made it more difficult Syrian refugees to gain entry to the US. 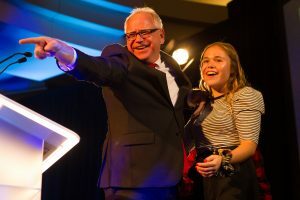 Since announcing his candidacy for governor, though, Walz has shifted to the left. He pledged to donate his NRA campaign contributions to charity after the shooting in Las Vegas in October, softened his position on refugee admittance, and named a progressive state representative, Peggy Flanagan, as his running mate. 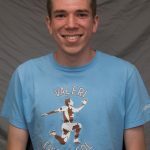 Peter Jarka-Sellers ’20, who also voted for Walz on Tuesday night, agrees. But neither Jarka-Sellers nor Hernandez were surprised to see Otto – a member of the Macalester class of 1985 who has won three straight statewide elections – carry the preference vote in JBD on Tuesday night. “Being endorsed by Our Revolution in a district that during the 2016 primary went extremely for Bernie Sanders, it does not surprise me at all,” Hernandez said. Otto finished second across the state, while Murphy – whose State House district includes Macalester – finished third. Roarty met Murphy through her first-year course in political science last fall, and supported her on Tuesday night. 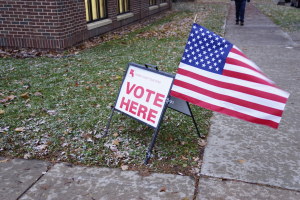 The straw poll is nonbinding and its winners – notably R.T. Rybak in 2010 and Marty Seifert in 2014 – have often failed to ultimately secure their party’s nominations. Whichever candidates eventually emerge, the DFL has reason to be optimistic: its turnout on Tuesday was nearly triple Republican turnout. The gubernatorial race was not the only item on agendas across the state on Tuesday. At Macalester, resolutions supporting a carbon tax, stricter gun control measures, sustainable job creation in the Iron Range, increasing caucus accessibility and the mandation of environmental impact statements for all pipeline projects all passed unanimously. Another resolution, introduced by Sam Greenstein ’19, asks that the DFL support legislation to allow Minnesota residents to identify as gender-neutral on their driver’s licenses, following the example set by Oregon last June. It too received unanimous support. Hernandez was pleased with how the night unfolded. Of those 23 delegates, who will report to the DFL District Convention on Mar. 23 at Central High School and consider resolutions passed at caucuses throughout the area, 11 are women, 11 are men and 1 is non-binary.